This would have been slightly more interesting if I’d known it while I was there, but there are 72 names on the Eiffel Tower; Gustave Eiffel called it “an invocation of science” because of his concerns over protests against the tower. It doesn’t sound especially plausible, that a list of names would calm down protesters, but the very existence of the tower indicates that it worked. I guess. 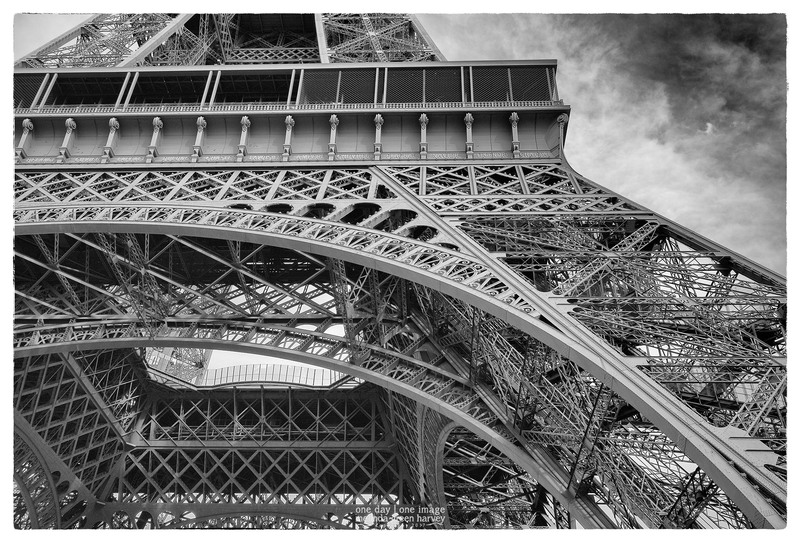 Posted on July 24, 2017, in Photography and tagged 365 photo project, architecture, black and white photography, Eiffel Tower, France, iconic building, iconic location, learning to see, Leica, melinda green harvey, monochrome, one day one image, Paris, photo a day, photography, postaday, thoughtful seeing. Bookmark the permalink. 3 Comments. Thanks for the explanation about the names, Melinda. I noticed them in yesterday’s photo and wondered what they meant. I was not aware of all the filigree work on the tower. What a mixture of old and new aesthetic. I really didn’t anticipate the filigree, either. I’ve got a photo coming up in a couple of days that shows it much more clearly than either of the two I’ve already posted.